The Yarmouth Seafest Car Show is an annual automotive event featuring antique, classic, custom, motorcycles and special interest vehicles of all sorts. The show takes place on the third weekend in July in the scenic town of Yarmouth and has become not just a premier event in the area but also one of the largest auto events in the Province of Nova Scotia! The show is organized by the Roaring 20’s Antique Auto Club and the 2019 event will mark the club’s 40th year hosting their annual show! The operation of the Yarmouth Car show has seen the need for growth and now helps to support multiple non-profit organizations in the local area as they work together to make it all happen. 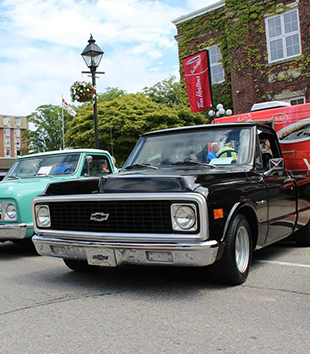 The show has seen tremendous growth and support over the past few years and has grown to play host to over 700 vehicles and an estimated 13,000 spectators making it the most successful car show in Yarmouth’s history! The town’s rustic and colorful Main Street is the venue for all of this automotive fun and is populated with a number of local retail stores, restaurants, cafés, and the famous Frost Park. Main Street is typically shut down from Forest Street to the show’s entrance of Grand Street, located next to the club’s Registration office at the in The Rodd Grand Hotel. The show takes place during Yarmouth’s annual Seafest Festival which brings with it many other local events taking place all over the town and municipality. If you’d like to do some sightseeing and/or cruising well we have you covered there as well with scenic seaside and country routes and destinations such as Yarmouth’s famous lighthouse (which was the shooting location in the spring of 2018 for the film ‘The Lighthouse’ starring Willem Dafoe), heritage properties, Yarmouth County Museum, Port Maitland Beach, Yarmouth’s Historic waterfront and much more! The club and car show committee would like to thank all of those who help to make this event possible and we look forward to seeing everyone in attendance for another unprecedented year in 2019! Making vacation plans for 2020? Come and join us at the Yarmouth Car Show from Friday, July 17th to Sunday, July 19th, 2019 for a fabulous weekend in Yarmouth, N.S!